As a young boy in the late 1950's I saw a color picture of two pipers from the Royal Irish Fusiliers in a magazine. 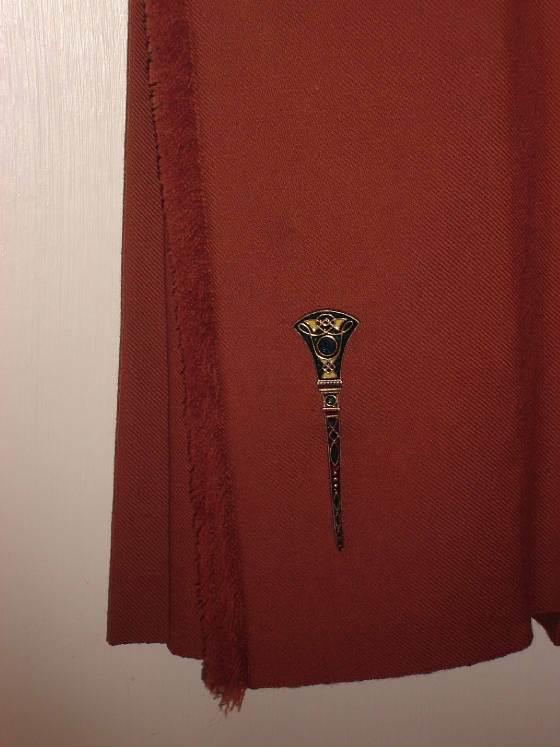 At the time I noted the shoes with buckles, the saffron colored kilts and their bagpipes. I knew about saffron kilts as they were also worn by male Irish dancers. As I knew nothing about bagpipes I did not notice that their sets only had one tenor drone to go along with the one bass drone. I did not know that a highland pipe had two tenor and one bass drone. At the time I was not interested in that sort of thing. I just wanted to play football. It would be many years before I would take up the pipes. 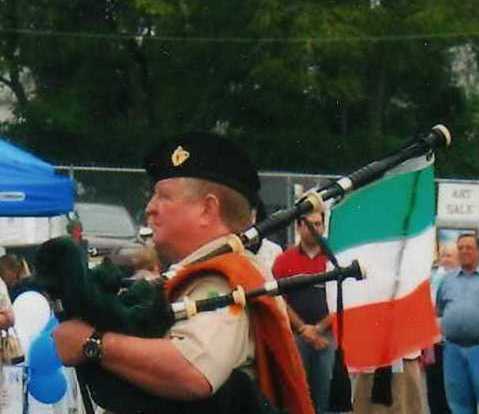 in 1994 I met Dave Holmes who got me started on the pipes and I began getting instruction from the great Pete Sullivan a piper from the CO Kerry. We were playing Highland pipes and Pete was not interested in the warpipes. We never spoke of them. As time went by I became more interested in the history of the pipes in Ireland. As I read more about the Gaelic League I became very interested in the warpipe. One of my friends was a St.Louis city police officer. He was learning on a practice chanter as he could practice all nite alone in his squad car. 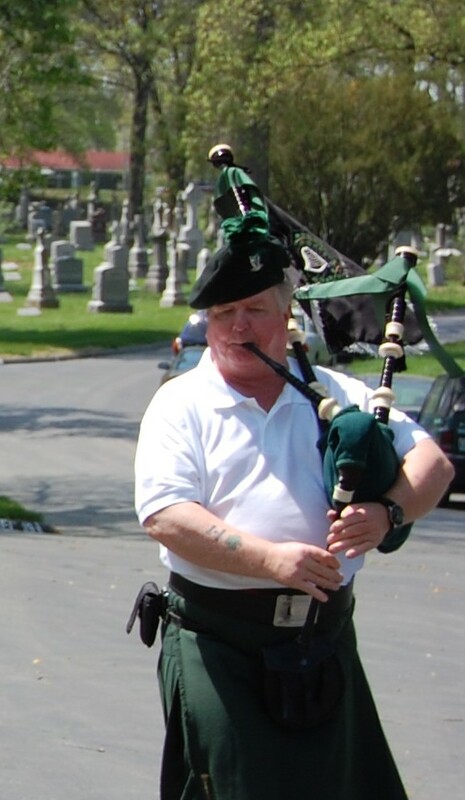 He mentioned to me that if he ever got on the pipes that the only set he would play was a two droned Irish warpipe. This planted a seed in my mind that would flower a few years later. One Saturday I was playing outside St. Michael's church after a wedding. One of my drones shut off and as I did not want stop with all those people around me, I continued to play. I noticed that no one in the crowd noticed any change in the tone of the pipes and I thought they were sounding very good. On that Monday I ordered a new bag cut for only two drones and a custom made bag cover for it. I took an old set of pipes I had and tied in the bass and one tenor drone along with the stocks for the chanter and blowstick. I played that set for a few months and was not as happy with the sound. As I had thought that my African Blackwood set made by Dunbar had sounded great at that wedding when the tenor shut off so I sold that set and Tied in the Dunbar drones. I am still amazed at the rich full sound that this set up can produce. 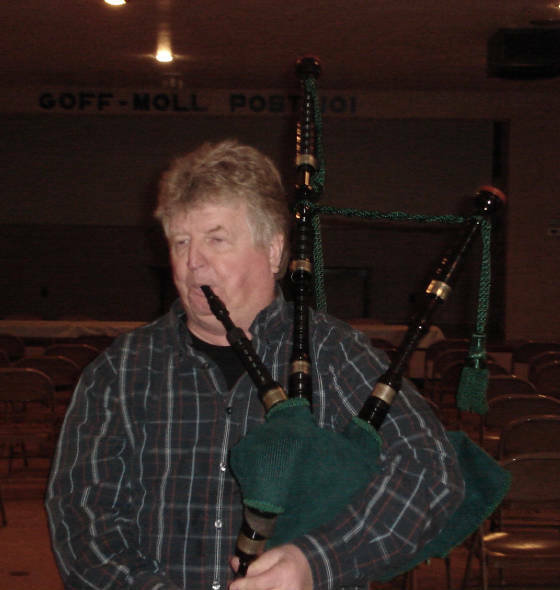 I played a few weddings and other Irish events with this set and as time went by I began to get requests from people asking me to use the warpipe instead of the highland pipe. It wasn't long before I became known for that set. My research on the warpipe has lead me to find other warpipers in Ireland, America, Canada, England and Australia. Many are featured on this website. I am in contact with many more that are not on this site. As I have said before, playing this instrument is much like the person who likes to own and drive antique or vintage automobiles. Modern cars are much better than years ago but yet some people prefer them. 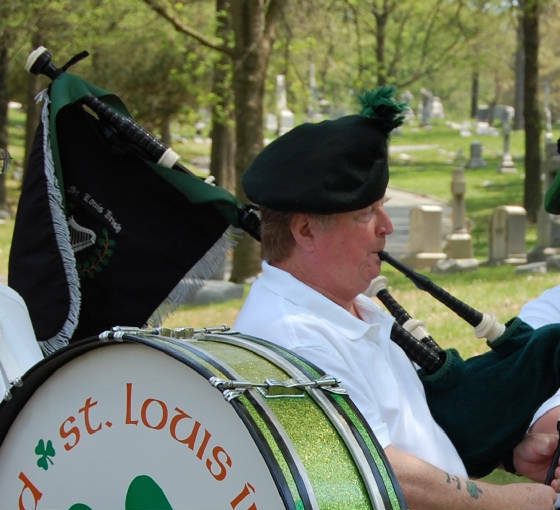 I also tend to think about those great Irishmen pipers that played the warpipe and served in both World Wars and in Korea. They took this instrument around the world inspiring the Irish to victory. My interest in the instrument really picked up after reading about the Volunteers, the Gaelic League and the idea that this instrument never really died out. It has been kept alive by those like myself that wish to preserve it as living history. I now often think about that picture of the Irish Fusilier pipers I saw as a young boy and wonder why it stuck with me after all these years. Perhaps it was an omen of things to come. I wish I had that photo today. It would be on the Home Page of this site. If I came across it again I would put it there. The above two pics show my two droned set made by David Booth. My previous sets had Dunbar (excellent) and another set had unknown (just ok) make of drones. I cleaned up the above old set of chalice top pipes made by R G Lawrie after 1931 and before 1950. It has not been posible so far to get a closer date of production. From about 1900 on the Lawrie catalogs listed Irish Warpipes along with their great line of Highland bagpipes. As a Warpipe is really a Highland pipe with one less tenor drone these sets were easy to produce and market. I should mention that two Lawrie owners have have examined this set and say they are Lawries, exactly the same as the sets they own. The guy I bought them from thought they were made by RG Hardie. I have since sold this set to someone who found this site on the net and wanted to buy it.. It's amazing how many people contact me about getting a two droned set for themselves. Below is a photo of my first set. Coming soon, a picture of my current set.